BEN Simmons proved his rookie year was no fluke with a stellar performance in the opening game of the NBA season but it wasn't enough to prevent a thumping at the hands of eastern conference rivals Boston. 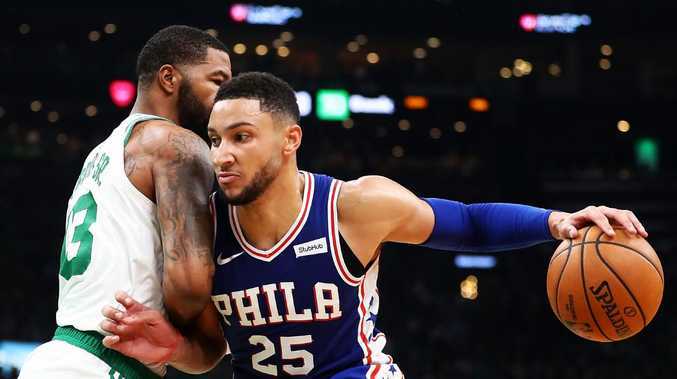 Just as they did in the conference semi-finals last year, Boston held firm against the young Philadelphia 76ers before pushing them aside with a dominant second half. Behind a game-high 23 points to Jayson Tatum, the Celtics prevailed 105-87 in Boston on Wednesday (AEDT) - but that didn't stop Simmons adding to his thrilling highlight reel with a big-time performance. By half-time the Australian had nearly notched a double-double - having stuffed the stats sheet to the tune of 10 points, nine rebounds, five assists, two steals and a block. By full-time he checked out just shy of a triple-double, dropping 19 points, 15 boards, eight assists and four steals. And he set NBA Twitter ablaze with his phenomenal court coverage and vision - such as his second-quarter over-the-shoulder assist for fellow No.1 pick Markelle Fultz. The Sixers experimented with playing Simmons away from point guard, in order for he and Fultz to coexist in a small-ball line-up but Simmons proved he remains most valuable when given unfettered access to the ball. Aron Baynes impressed for the Celtics. Gordon Hayward made an emotional return to the court for his first NBA game since suffering a season-ending broken leg and dislocated ankle six minutes into last year's opening game against Clevelend. The star wing received a standing ovation when he left the game late in the fourth quarter with 10 points, five rebounds and four steals to his name. 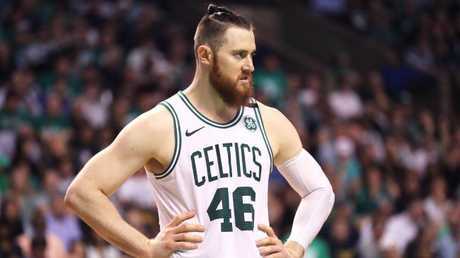 Australian big man Aron Baynes earned praise for his dominant second half, with NBA legend Charles Barkley calling for Celtics coach Brad Stevens to give the Boomer some more game time to provide better balance to the team. Baynes, who hit two three-pointers, finished with eight points, four rebounds and three assists. The 76ers' Australian rookie Jonah Bolden was brought on in the final minute and did not take a shot.